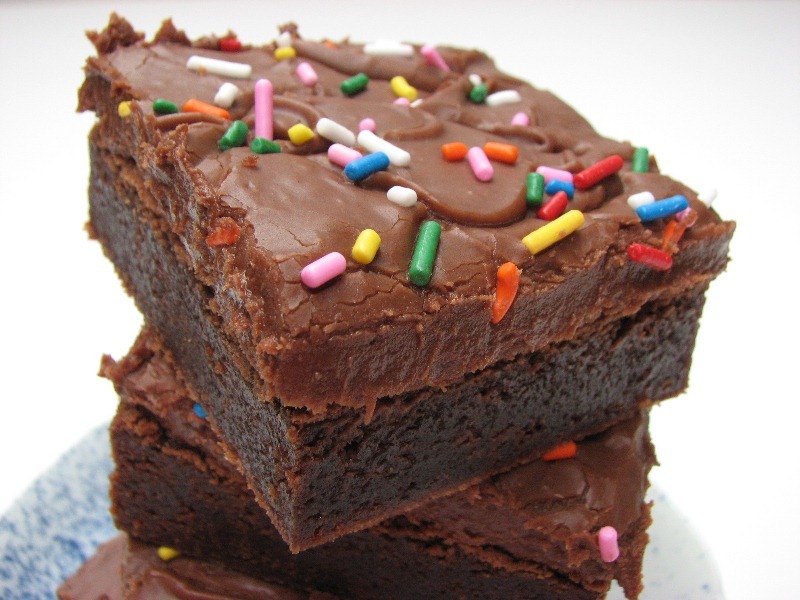 This is such an easy brownie recipe. It's absolutely delicious. The chocolate is not super dark, but it's not as sweet as milk chocolate either. 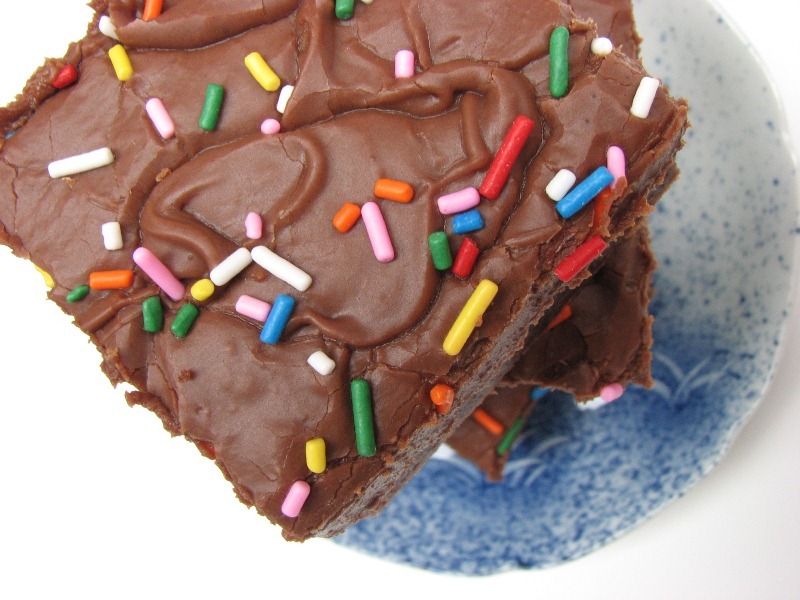 The texture of these brownies is a cross between fudgy and cakey. Of course they will be fudgier if you take them out of the oven earlier. Mine have a slighty crunchy outer crust with a soft fudgy center. They developed a nice flakey crackly top which to me is a sign of a GOOD brownie. 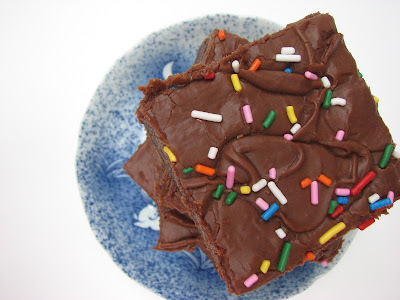 I covered the top of mine with a buttery chocolate icing that was fairly thin while warm but firmed up and became fudge like when cooled. 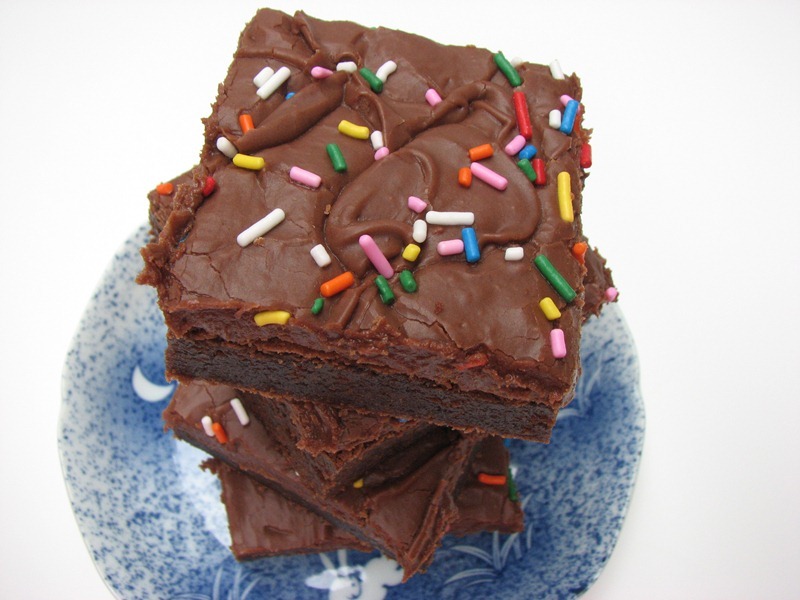 I know when you read the ingredients of these brownies, your eyes will go to the "shortening". Mine did. 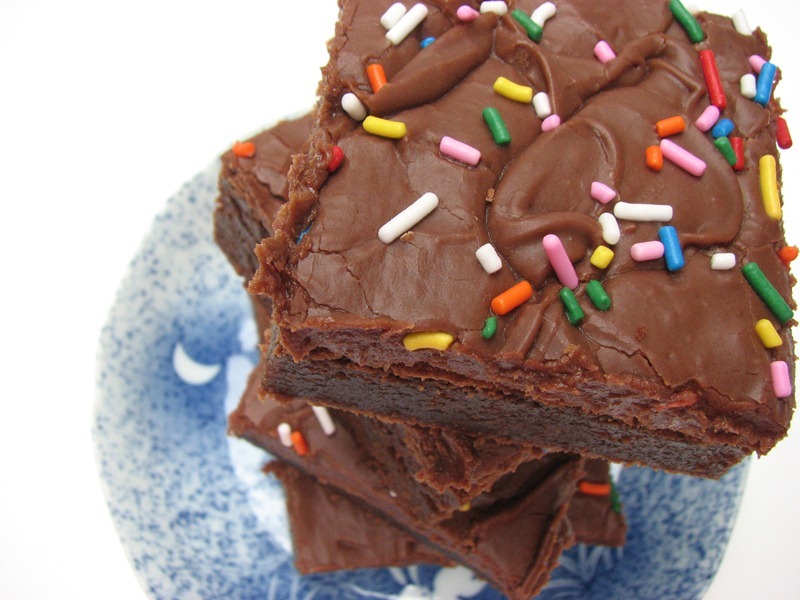 There is no butter in this brownie recipe. I was not sure what this omission would do to the texture or especially the flavor, but I wasn't disppointed. These are so tasty. I made sure that I removed my brownies from the oven before they tested done. I did the toothpick test but there were still very sticky wet crumbs on my toothpick when I removed the pan. I hesistated and almost placed the pan back in the oven but I'm glad I didn't. When these were completely cooled they were perfect!! I will definitely make this recipe again. Oh, I wanted more brownies than an 8 inch pan but there did not seem to be enough batter in a double recipe for a 13x9 inch pan so I made a triple recipe and it was a perfect amount for a 13x9 inch pan. Grease the bottom of an 8x8x2-inch pan. Melt the chocolate and shortening together over simmering water or in the microwave. Cool slightly. In a mixing bowl, beat the eggs well. Add the sugar and combine thoroughly, then stir in the chocolate mixture. Sift the flour together with the baking powder and salt, then stir into the chocolate mixture. Stir in the nuts and vanilla. After cooling for about 20-30 minutes, spread icing on top and let cool completely before cutting. In a medium bowl combine the powdered sugar and the cocoa powder and stir to mix well. Add the melted butter, milk and vanilla and mix until smooth. It's ok if icing seems somewhat thin, it firms up when thoroughly cooled. Oh my goodness, I am drooling. And I LOVE Trisha Yearwood too. Now, how good can my day get. I'm so going to add you to my bloglist. Don't want to miss anything. these look so delish! :) love your blog! Those look soooo good ! My brownies look nothing like this and I didn't change a thing (except doubled the recipe and baked in an 11x8 dish). I used bakers chocolate and all but mine are a very light shade of brown and mine are not as flat as yours...mine rose quite a bit. Any thoughts as to what would cause the difference? Hmmmm....I dont know why your brownies would appear lighter in color. I think mine are flat because I removed them from the oven so early. They were a lot puffier when I first removed them but they deflated as they cooled and became super dense & fudgy. Like I mentioned up above, my brownies did not appear done when I removed them from the oven. I hesitated before taking them out but I'm glad I did because the consistency was perfect after they cooled. 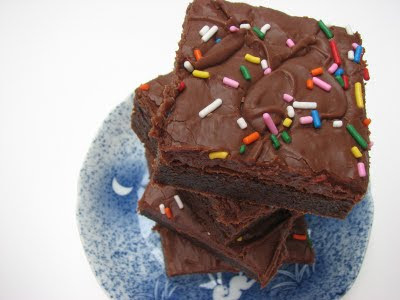 It's been awhile since I made this recipe but I do remember that they were a nice dark brown. I made a triple recipe and put them in a 13x9 inch pan. You would think mine would be extra thick! did you use shortening when you made yours? Yes I did use shortening and loved the results! You mentioned tripling your recipe for a 9X13 pan. Did you also triple your frosting recipe? No I did not triple the icing recipe. Just made it as is. How long did you bake the brienues for if you tripled the recipe? Hi Gail, I'm going to be honest, I made these so long ago that I have no idea how long they baked. But u know, I never really pay attention to the time I bake something and I never set a timer. I always have a general base amount of time when I know I will check a few minutes before that time and continually check after. I RARELY ever end up baking anything for the amount of time a recipe calls for. For a 13x9 pan I would suggest testing at 30 minutes (only if you have triple the amount of batter in it). U might have to check every few minutes til 45 min. Depends on your oven. 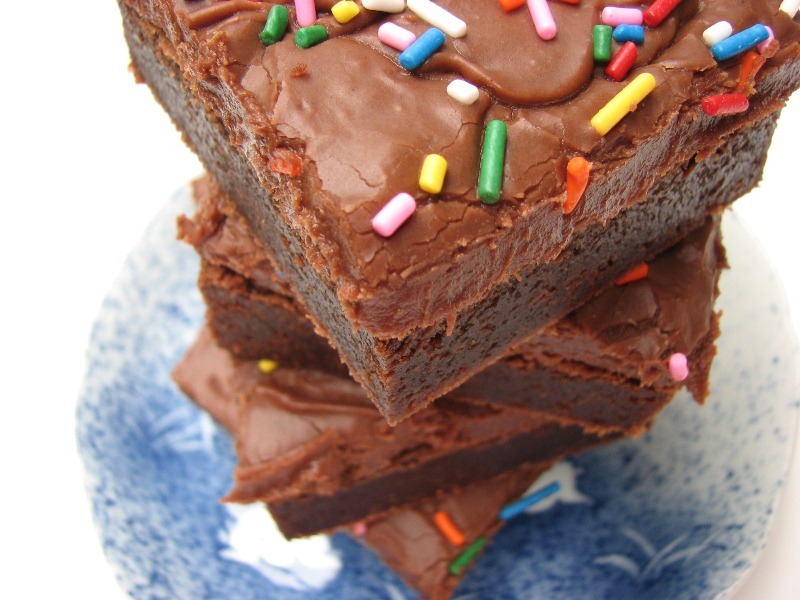 Brownies are difficult to determine when done. I've made dozens of recipes and still doubt myself when I remove from the oven. I personally test by poking the corners and edges of the brownie. Do they feel firm and structuredo? Or are they still super soft and mushy? I lightly tap the center. You want soft in the center but not batter consistency. If your edges are nice and set then I would rem9ve the pan and set on a rack to cool. You don't want the edges HARD when u poke them. That means you left them too long. Sorry I can't give you a more exact number. Enjoy!